Have you been to Reality Kitchen (645 River Road in the former Wild Plum Pies space) yet? Chef Jim Evangelista’s brainchild, the café provides training and experience for developmentally disabled adults, who help the bakers create some unusual breads, fantastic pastries, and even chocolates. The cases groan with a range of sweet and savory well-crafted croissants every morning, and whatever strikes the team’s fancy, like marionberry bread pudding, carrot cake, and cherry turnovers. You can also order up breakfasts and lunches of sandwiches and soups…all at budget prices for the quality. 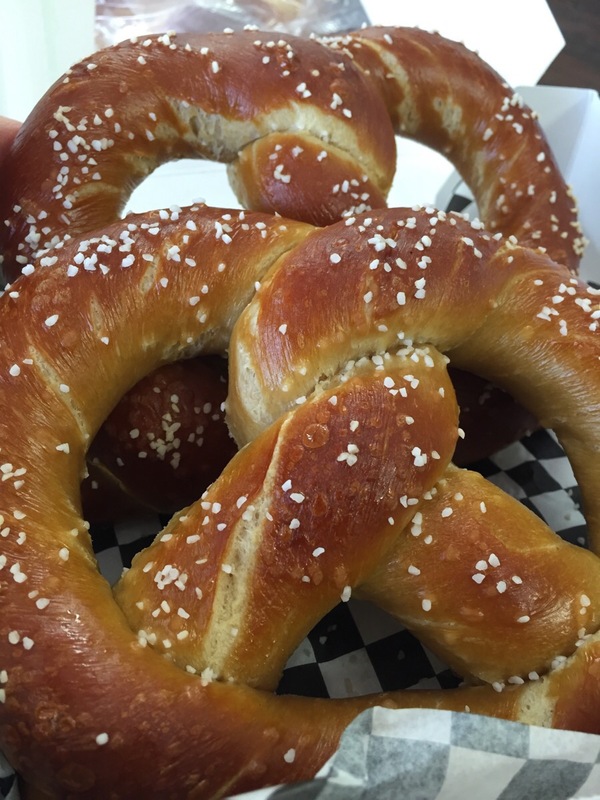 But the real standout is a special order item — huge, soft, Bavarian-style pretzels. They’re just as good as anything I had in Germany, and I ate *a lot* of pretzels in Germany. Since they don’t keep well, you need to order ahead of time, so give them a call at (541) 337-1323 and order at least 3. You won’t regret it. $3 a pretzel. Previous Article food symposium and a few spots left in my writing workshop on saturday!